I created a blog for our Art Teacher Inservice, which is tomorrow. I & three other art teachers are leading the sessions for the elementary division. We'll have over 90 elementary art teachers coming through our classes & going on a field trip to Cheekwood & The Frist Center to see the Chihuly Exhibits. Our sessions are hands on studio projects, but I wanted to have something that the teachers could revisit once they get back to their classrooms that they could actually use for their lessons. On the site you will find links, lessons, videos, pictures, and more. 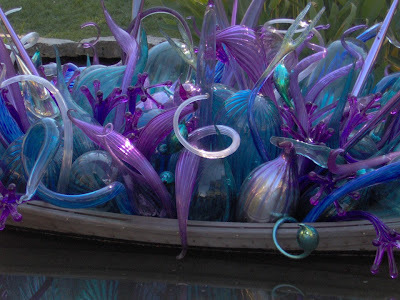 I thought I'd post it on this blog....because some of you might want to try the lessons as well (even if Chihuly's work isn't in your city). There should be enough information & images for you to provide your students the background knowledge necessary for the unit plan. Please feel free to contact me if you have any questions on it. The site is for educational purposes only. Oh!!! That is just beautiful! I'm sure more so in person. THANK YOU for sharing this with us! I love the work of Chihuly, and have been wanting to do an interesting (and affordable) project! I'll be adding this into my curriculum this year! Thank you for sharing this. I will definitely use this in my curriculum this year. Beautiful.